Click the "Export Contacts" command on the File menu. Click the "Export Contacts" button at the top of the Contact Editor. Contact data can be exported to a CSV (comma separated value) file. Many other contact management software is capable of importing contact data from CSV files. The exported file can also be opened and edited in Microsoft Excel. To export contact data, select the "Export -> Export Contacts" command on the File menu or click the "Export Contacts" button at the top of the Contact Editor. After selecting the "Export Contacts" command, a window will appear where the file name and location for the exported file can be specified. To export as a new file, type in a file name. To overwrite an existing file, click the file to select it. You'll be prompted to confirm. After specifying the output file, click the Save button. 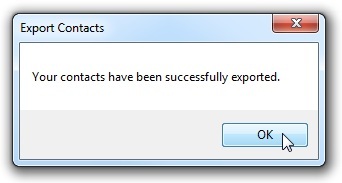 All your contacts will be exported to the specified file. This can take several seconds, depending on how many contacts you have defined. A message will appear when the export is finished.